When the second generation fastback Barracuda hit the streets in 1967, Car & Driver decreed it the best looking car out of Detroit that year. Even though it was essentially still a Plymouth Valiant under the skin, the new sheetmetal was so smooth it looked like it was poured on. The notchback coupe incorporated a design so fluid, it even made the Mustang version look boxy and abrupt in comparison. Many Mopar aficionados still consider the notchback Barracuda one of the purest two-door body designs to ever come out of Highland Park. To support that theory, fast-forward 44 years and feast your eyes on the car before you. It represents the complete transformation of a slippery looking design, down on power, to a vivid fireball of a machine with horsepower to burn. This Barracuda is the imaginative product of Georgia resident John Wintersgill and two of his Mopar buddies (Mitch Stewart and Nick Leory) who looked at this car as a blank canvas. This Barracuda had been languishing in a garage for 15 years when John found it. It was covered by pieces of lumber, paint cans and ladders. It never knew the meaning of the word rust, but its interior and paint have seen better days. The resurrection of this car took over eight years, happened piece by piece and was done on a family man’s budget. That means John and his Mopar buddies donated countless hours and effort to the cause. The original mission statement was to build a highly satisfying street machine, so the design parameters were wide open. Since Mopar folks think of Hemis or Max Wedges whenever they see the color orange, what better exterior hue can you think of for this car? When set off with black accents, the finished (or nearly finished) effect is striking. It was actually Nick who came up with the idea for the AAR stripes on this ’67 even though it was a 1970-only option. It seems he had a rear quarter panel from a AAR ’Cuda hanging on a wall in his garage and thought it would be cool to replicate the look on John’s ’67. To sell John on the idea, Nick actually used his fingers to draw the stripes in the accumulated dust on the ’67 at the very beginning of this project. John concluded if it looked that good depicted in dust, it would be fantastic in reality. The Barracuda’s original engine was a 273 two-barrel generating a mere 180 horsepower. Now, energy comes from a balanced and blueprinted Mopar Performance 360 A-block. Local Mopar engine guru Gerald Wright actually assembled the 408cid stroker. The A-block displayed 441 horses at 6,100 rpm. By 5,000 rpm, it was making 429 lbs-ft of torque. The original low-performance 904 automatic transmission was pulled out and replaced with a trusty 833 four-speed and Mopar clutch assembly. One of the key design elements of this car was then attached – a pistol grip Hurst-based shifter. Continuing with the upgrades, John snatched out the original 7¼-inch rearend and replaced it with a more power friendly 8¾-inch rear utilizing a factory Sure-Grip with 3.23 gears. A 3.91 gear set will replace it soon. A classic pinion snubber keeps that rear end in proper alignment with the street. John tried to think of everything during this build. He crafted a set of subframe connectors and tied everything together with an eight-point roll cage. It took John and his two Mopar accomplices 12 hours to build and install the cage. Underneath, John rebuilt the suspension, added heavy-duty torsion bars up front and Super Stock rear springs. Mopar Mitch handled the creation of the mini-tubs and also tweaked the rear fender wells for the more traction friendly Mickey Thompson tires. The Barracuda’s interior is a work in progress, although some very nice progress has been made already. The seats were completely redone. Mike Rivera made them look just like original equipment units. The new material also eliminated the foul smell that had accumulated during the car’s years as a small animal shelter. It includes a 140mph speedometer and a separate dial that houses four smaller gauges measuring fuel quantity, coolant temperature, volts and oil pressure. An Auto Meter tach keeps John accurately informed all the way up the rpm scale. 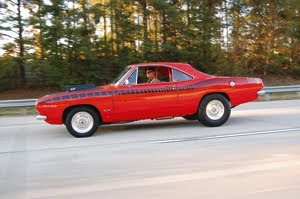 Throughout the course of the ’67-’69 Plymouth Barracuda production run, Chrysler offered the Hi-Po 273, the 340, the 383, the 440, and the race Hemi. In case you weren’t there at the time, everyone on the streets knew there was always a possibility a Barracuda could give Chevy and Ford lovers a serious case of indigestion. But if you think that’s just history and you’re off the hook now, think again. The roar you hear is coming from John’s Barracuda, and it’s fishing for dinner. Kevin Hart is always on a mission to better himself and others with the power of fitness and Nike Outlet Store a healthy lifestyle, so it should come as no surprise that he’s also celebrating Breast Cancer Awareness Month with a special pink colorway Kobe shoes of his Hustle Hart signature Nike training shoe. The special edition of the Hustle Hart features all the same motivational phrases written across Kyrie Irving Shoes its upper, and adds a vibrant pink colorway to help bring awareness to the cause. There is word yet on a retail release nike free 4.0 flyknit for the pink colorway, so stay tuned to Sneaker News for any updates.